Rebecca (Becky) Whidden joined Falvey’s Access Services in April. She works as supervisor on duty, with course reserves and at the information desk. With a bachelor’s degree in English from Union College in Schenectady, N.Y., and a master’s degree in elementary education from Lesley University, Cambridge, Mass., Becky worked in the book industry for nearly twenty years. 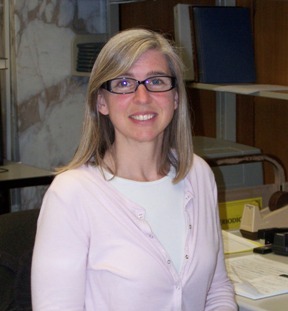 Before coming to Falvey, she worked in the technical services department of the Radnor Memorial Library in Wayne, Pa. Her first passion is children’s literature, having worked for a decade in a children’s only bookstore outside of Boston. Even now she continues to write book reviews for the children’s literature review publication, The Horn Book Guide. True life adventure tales, realistic fiction and anything written by Daniel Pinkwater are her favorite genres of literature. But, although she loves to read (and read and read), Becky grew up in Maine and subsequently enjoys the outdoors as well, swimming at the beach or hiking in the woods. Lately, she has developed an interest in yoga and in running, occasionally participating in races. Becky resides with her family in Wayne, but has lived in Boston, Mass. ; Providence, R.I.; and Colombia, Mo. She has also enjoyed summers in Maine and France. Travel is another favorite activity, and Becky hopes to make it to India, Tibet, Nepal and Bhutan one day.